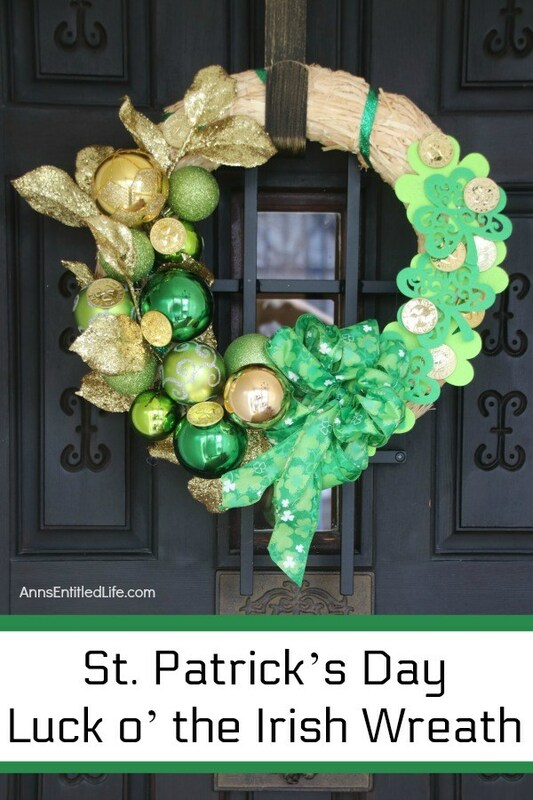 Dress up your front door for St Patty’s day with this easy to make St. Patrick’s Day wreath door decoration. 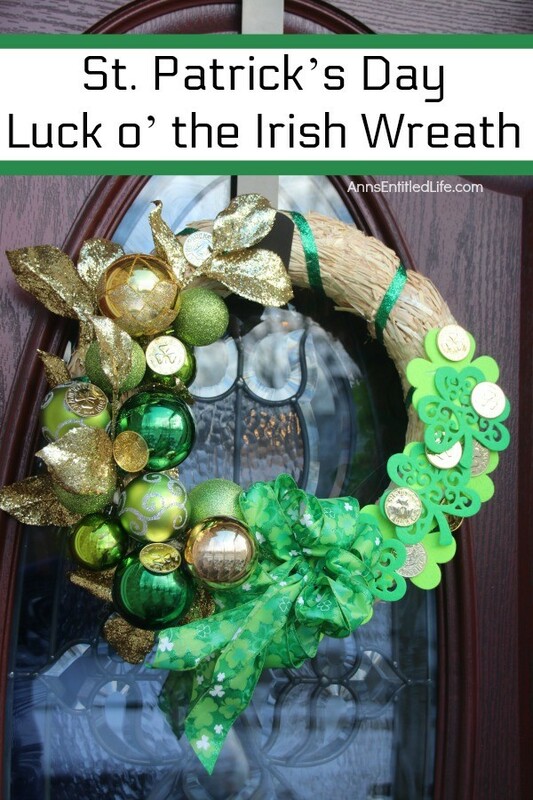 This is a fast, inexpensive wreath decoration that just might bring a bit of the luck o’ the Irish your way. 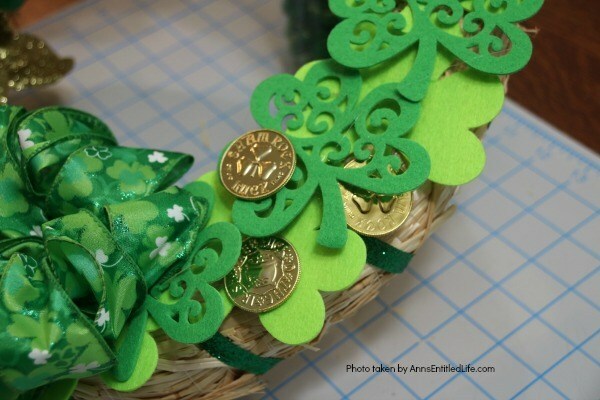 Find your pot o’ gold on this charming St. Patrick’s Day door décor wreath! This wreath is meant to be abundant, but not complete around the straw wreath. You, of course, can do what you like. 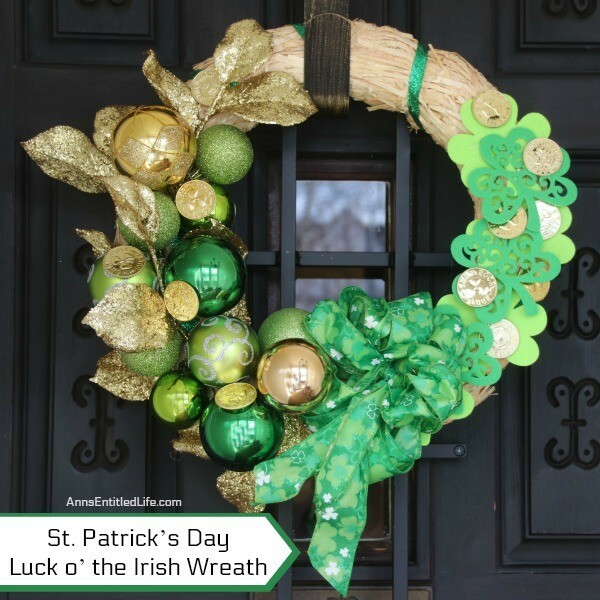 If you do not want any exposed straw, I’d suggest making the balls come up both sides of the wreath (duplicating each side), and then placing the shamrocks and coins at the top. 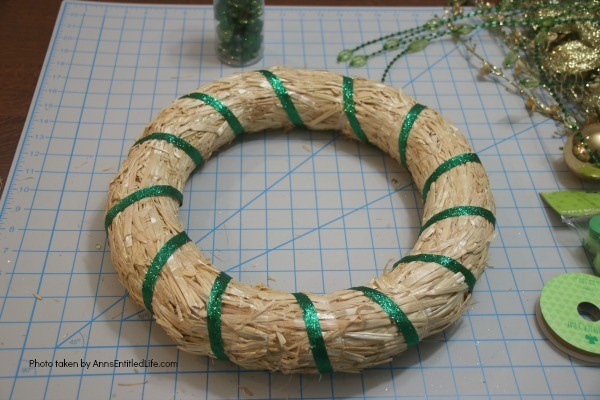 • Take the straw wreath outside to unwrap it, and then give it a good shake outdoors! This will remove the loose straw, and keep your house tidy. • Christmas bulbs were used on this craft – because I am cheap. Different textures, and various shades make for wonderful depth and juxposition of colors and textures. 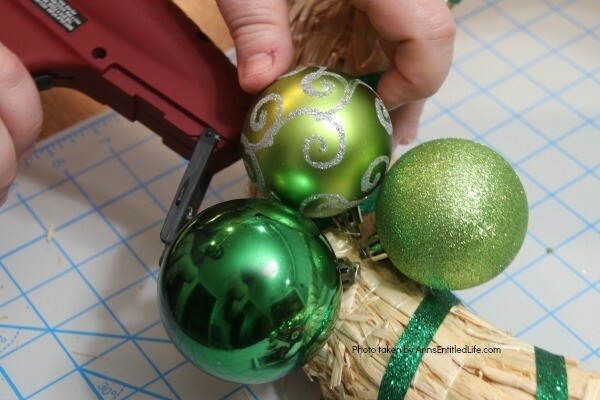 You can use craft balls in different shades of gold and green, but adhering them to the wreath may be a bit tricky. 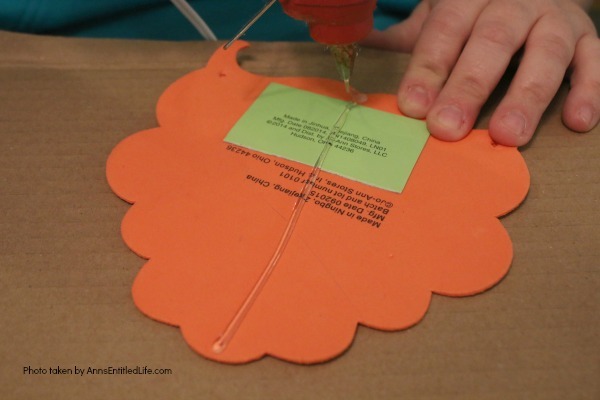 • Quilter t-pins + hot glue were used to attach the bulbs. You could also use the floral picks with the wire at the end, or you could try and use only hot glue, but it may be a bit difficult. 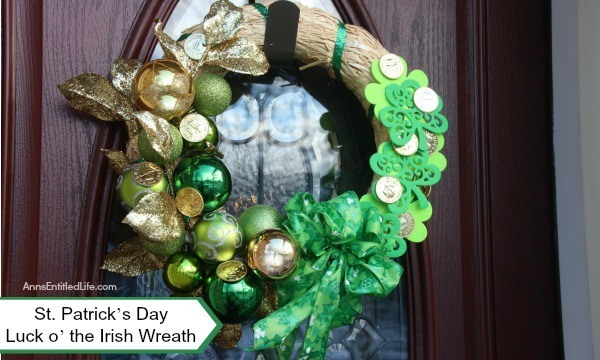 • Instead of felt shamrocks, you could cut out paper ones – providing your wreath is not expoded to the elements. 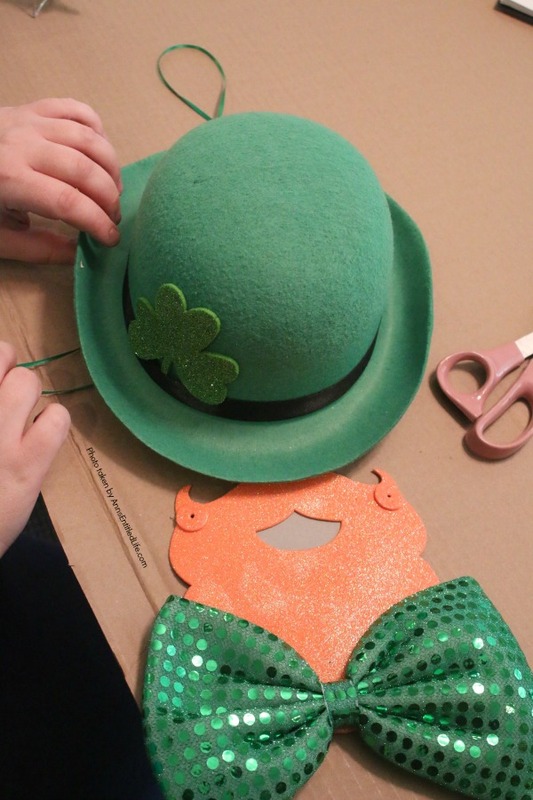 • You could also use pot o’ gold felt cutouts. • You can purchase the “gold coins” at the dollar store for a buck, or your favorite craft store for more. • Unwrap the straw wreath and shake for loose straw. 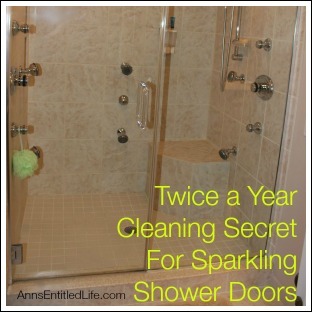 This is best done outside so as to keep your house and work area clean. 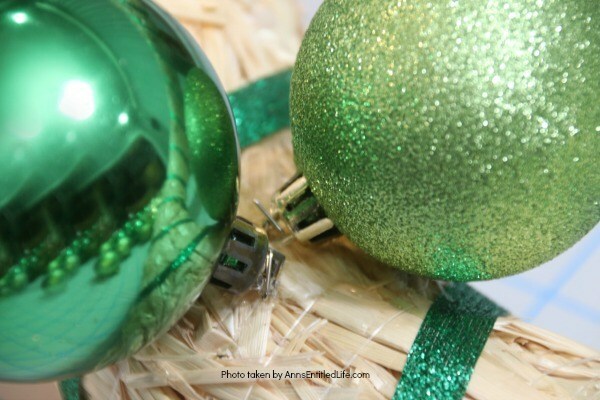 • Wrap the wreath with green ribbon (a narrow ribbon was used). Hot glue the ribbon in place on the wreath. 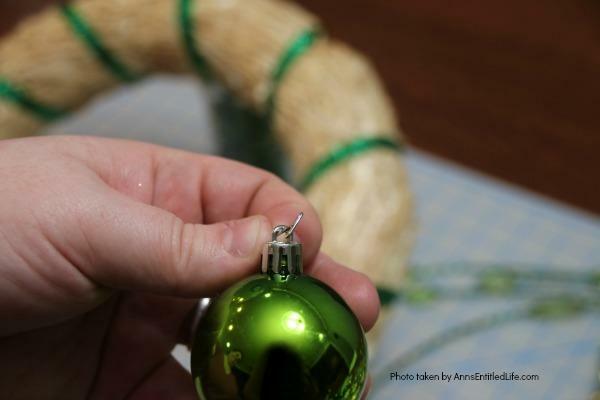 • Insert a quilting pin into the hanger portion of your bulb (at the top of the ornament cap). 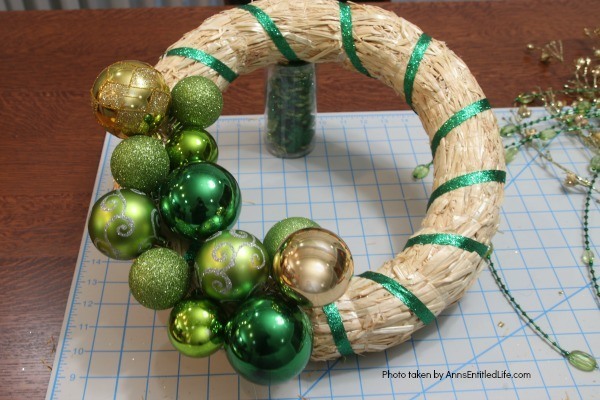 • Insert the pin into the straw wreath, then, dab a dot of hot glue under the ball to more firmly affix it in place. • Note: the pin is going to anchor across the ball wire hanger and you want to push that quiting pin in sideways to hide the ornament cap (hanger and pin) in the wreath and away from the exterior of the finished wreath product. • Proceed to attach more bulbs in the same manner. Pay attention to size, texture, and holes. If you want to place some smaller bulbs on top of the larger wreath-adhered bulbs, you can hot glue them to the existing bulbs, and hide those holes. 12 bulbs were used in total on this wreath. 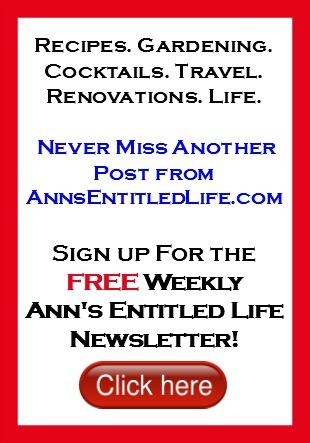 You can use more or less according to your personal taste and preferences. • Once you are finished with your bulbs, take a step back and make certain they are as complete as you would like, and firmly adhered to the wreath. 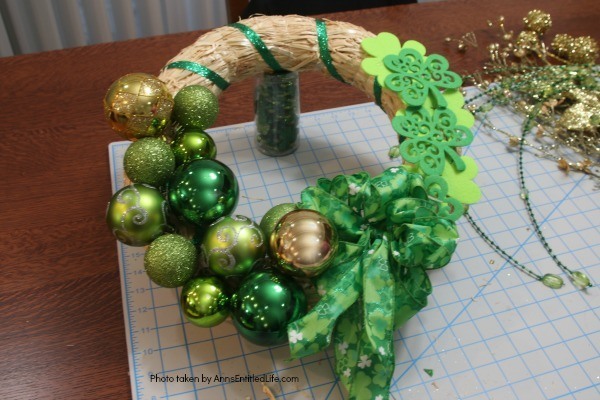 • Hot glue felt shamrocks to the other side of the wreath. 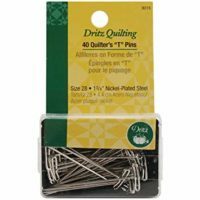 Insert a quilter pin to hold in place. • Place another set of shamrocks on top of the first set to hide the quilter pins. Hot glue in place. • Note: 7 shamrocks, two different colors, two different textures (4,3) were used in this configuration. You can use the same or different shamrocks according to your personal preference and taste. 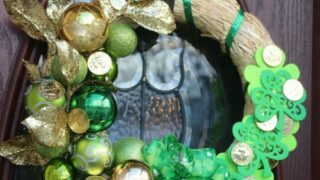 • Make a bow (or use a premade one), and using quilter pins and hot glue, adhere it to the wreath between the balls and shamrocks. 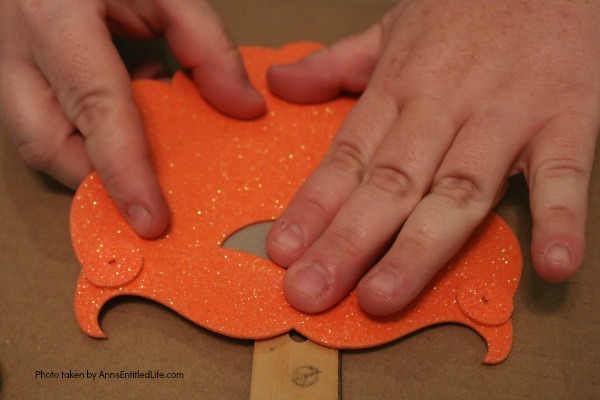 • Cut down the sparkly fill leaves and insert a few behind the balls. You are trying to hide any holes, as well as give some texture and the appearance of flow (outward). 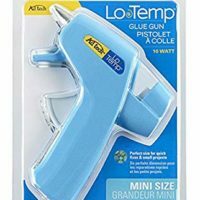 Use quilter pins + hot glue to secure in place. 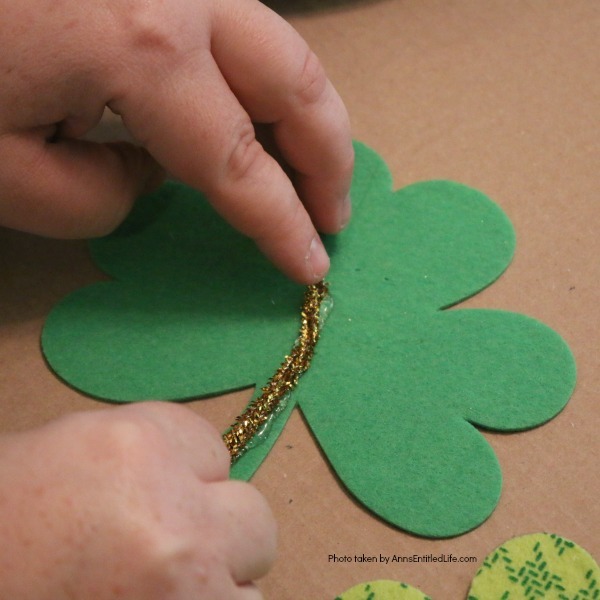 • Hot glue “gold coins” to the shamrocks and/or wreath and/or bulbs. • Give the wreath a slight shake to make sure everything is well secured. 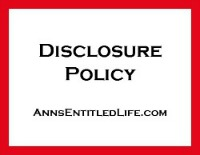 • Display door décor as you like! 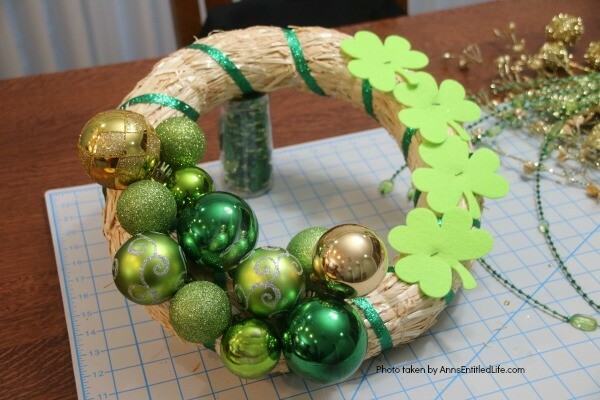 Find your pot o' gold on this charming St. Patrick's Day door décor wreath! This wreath is meant to be abundant, but not complete around the straw wreath. You, of course, can do what you like. 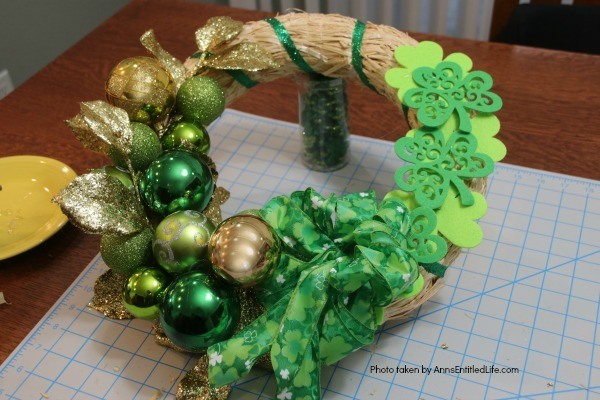 If you do not want any exposed straw, I'd suggest making the balls come up both sides of the wreath (duplicating each side), and then placing the shamrocks and coins at the top. 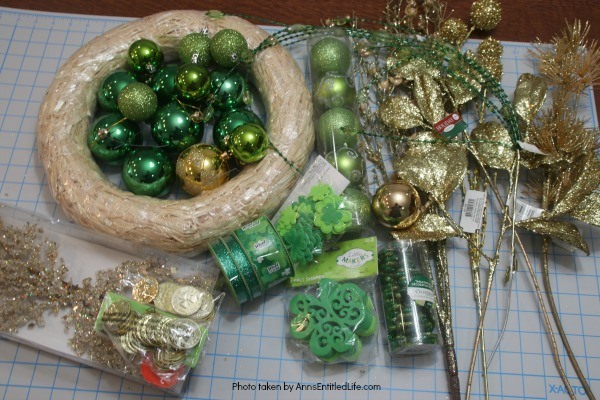 • Hot glue "gold coins" to the shamrocks and/or wreath and/or bulbs. 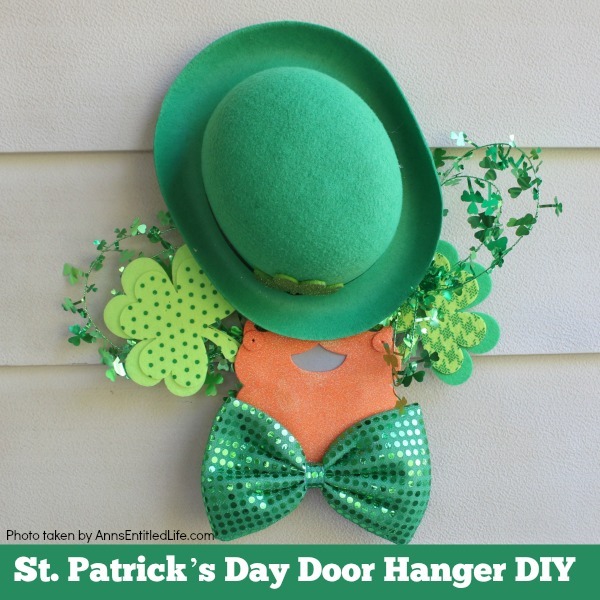 • St. Patrick’s Day Door Hanger DIY – Make your own St. Patty’s Day door décor! 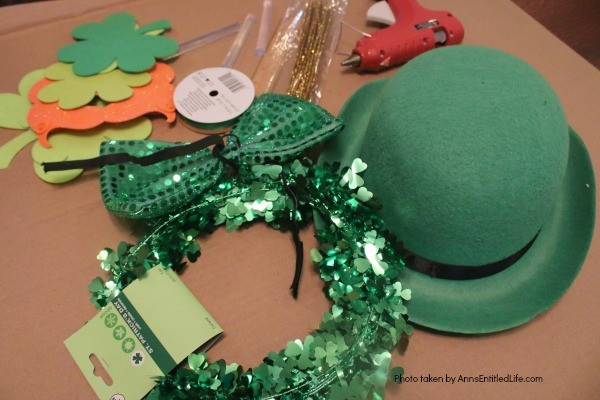 This leprechaun inspired, easy DIY tutorial comes together quickly when you follow these step by step craft instructions. 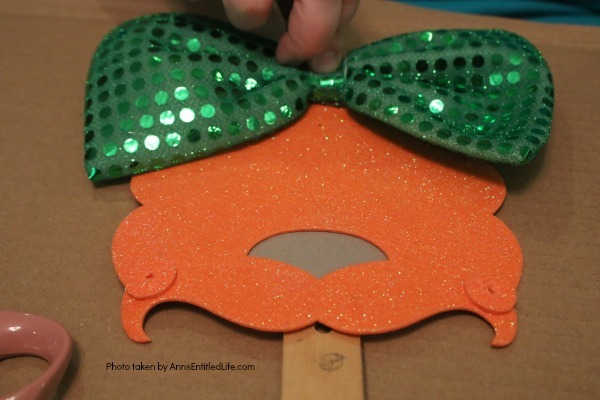 This St. Patrick’s Day Door Hanger DIY project is simply adorable! • Easy Unicorn Wreath DIY – This simple to make sparkly unicorn rag wreath is an adorable and whimsical take on a unicorn wreath. From the multicolored mane, sparkly white coat, and fanciful ears and cone, this delightful unicorn wreath is a playful take on the great mythical creature. 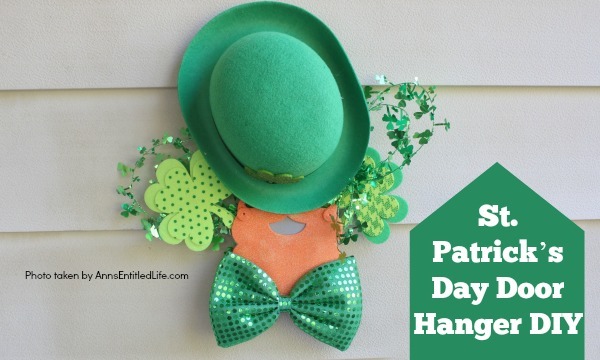 Make your own St. Patty’s Day door décor! 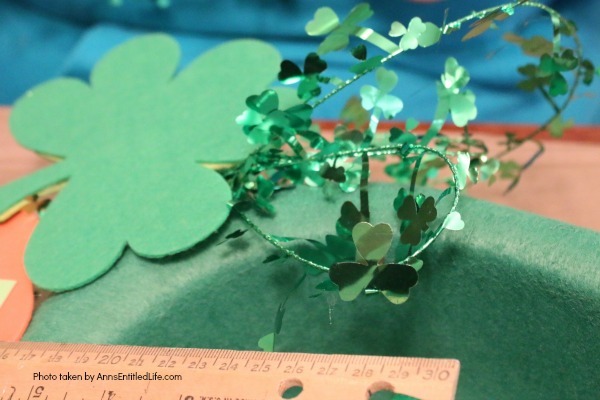 This leprechaun inspired, easy DIY tutorial comes together quickly when you follow these step by step craft instructions. 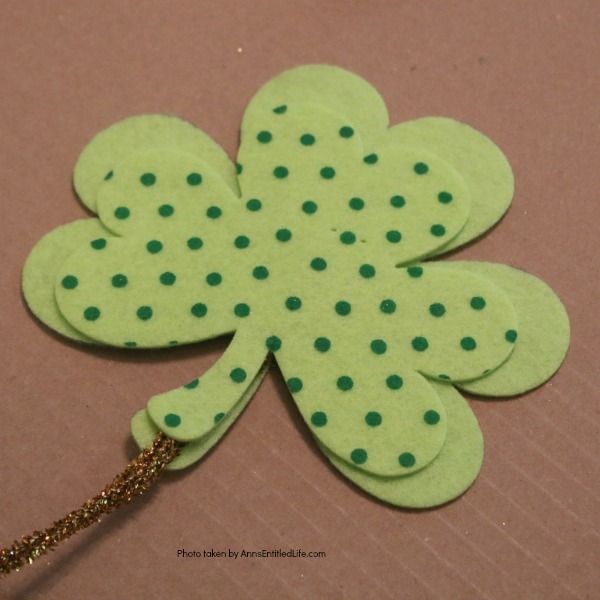 This St. Patrick’s Day Door Hanger DIY project is simply adorable! 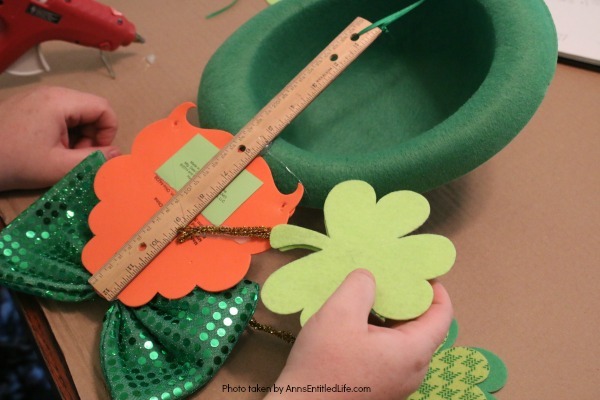 If you are looking for St. Patricks day decorations, this craft project is a real keeper. 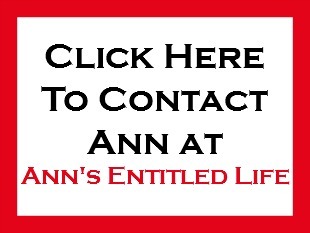 • Head over to Michaels, Joann or Hobby Lobby for the pieces of this project. The beard and shamrocks were found in-store. 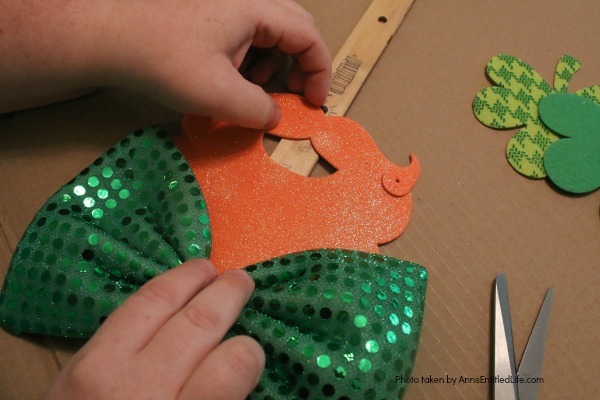 • You can always cut out your own beard and your own shamrocks from cardstock allowing for better variation! 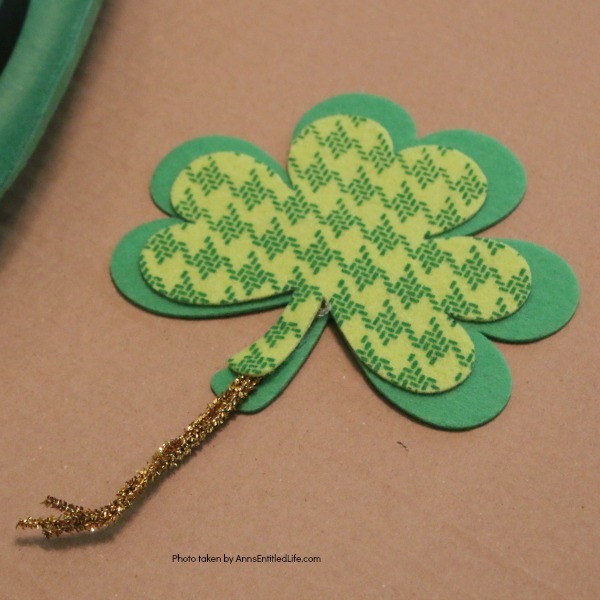 Use cookie cutters for the shamrock templates if you decide to cut your own! 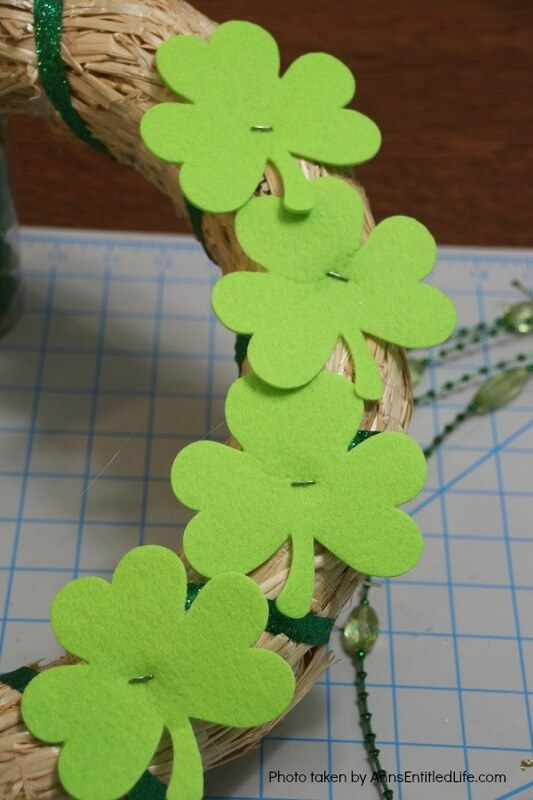 • The shamrocks are stacked on top of one another with pipe-cleaners in between to allow you to adhere the shamrocks to the door hanger and have all the shamrock seen. If you try and attach the shamrocks directly to the ruler, hat, beard, etc., most of the shamrock will be hidden by the attachment. 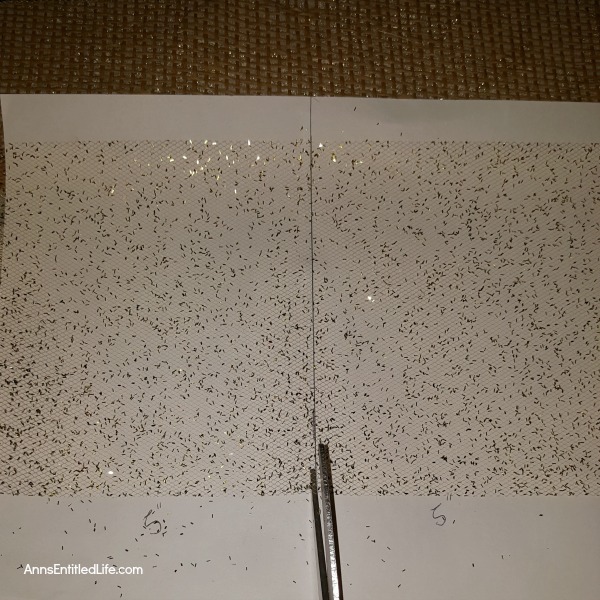 • This is a fast project, and yes, it is all done on the back of a ruler! • Shamrock Garland or get it here. • Lay out a ruler. Get an idea where you want to place the beard, bow and hat. 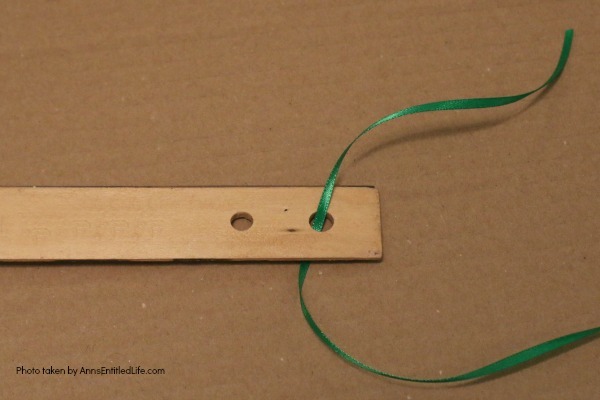 • Thread a ribbon (for hanging) into the top hole of your ruler. You do not have to knot at this time, but do make sure there is enough extra ribbon to go to the top of the hat for hanging. • Hot glue the beard to the ruler. If you do not want the mouth to show behind the beard, hot glue a piece of construction paper, cardboard, etc. over the open mouth. • Hot glue the bowtie under the beard. 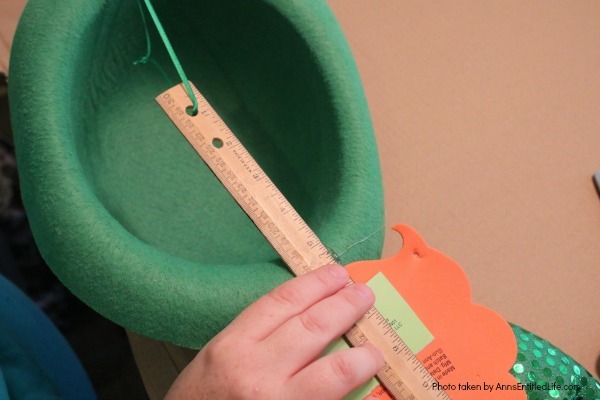 • Hot glue the hat to the ruler making sure the ribbon is free of the hat (over the top of it). • Hot glue the top of the ribbon to the hat making sure there is enough to hang the knotted ends of the ribbon. 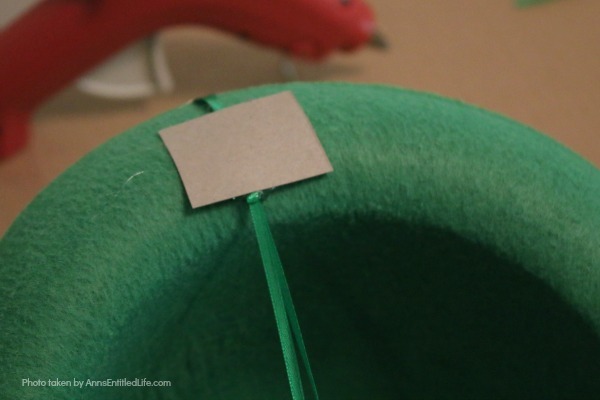 • Add a piece of cardboard and hot glue it across the ribbon for stability (otherwise that hat will be pitching forward). 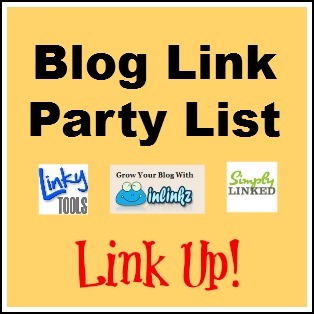 • Take two pipe cleaners, fold in half (cut if you like), and then twist together. 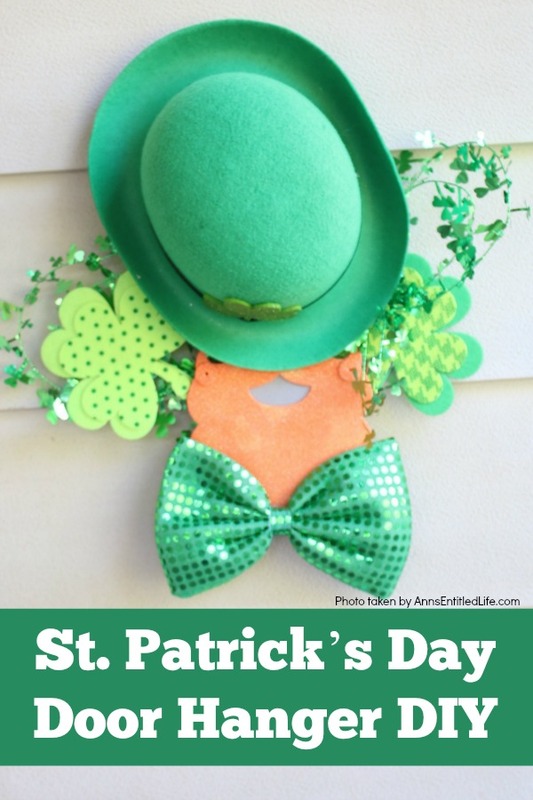 • Hot glue the twisted pipe cleaners to a large shamrock. Leave enough length so they may be attached to the door hanger and yet still protrude enough to be seen. • Hot glue a smaller shamrock over the pipecleaners on top of the larger shamrock. 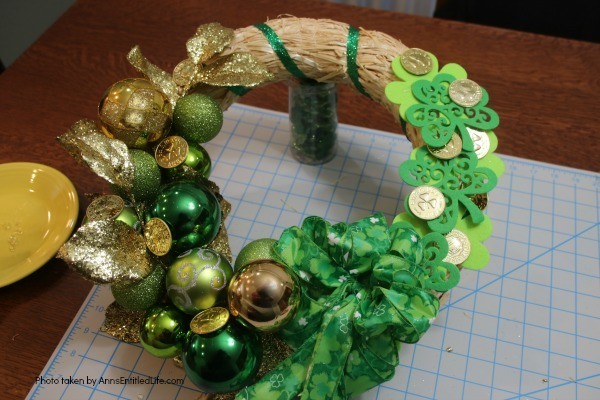 • Hot glue the pipecleaner portion of the shamrocks to the back of the door hanger. Again, make certain the shamrock protrudes enough to be seen on the frontside of the door hanger. 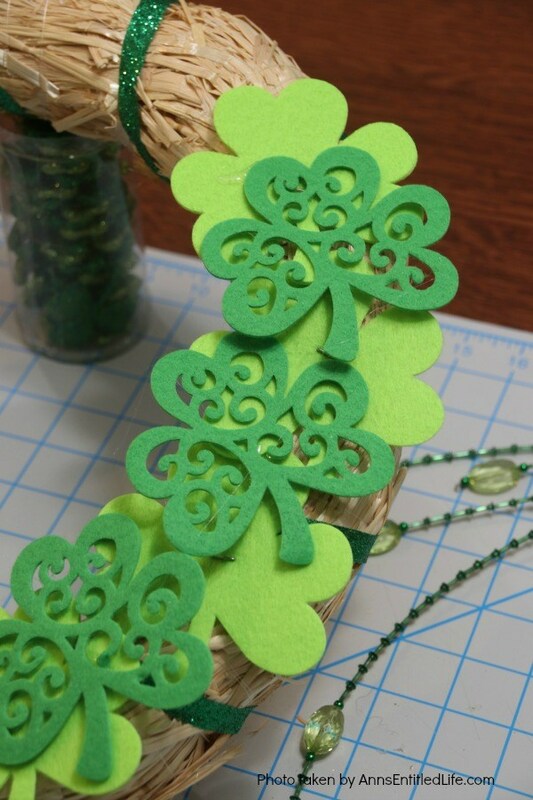 • Place some shamrock garland behind the shamrocks, you can shape into curves, cut, and hot glue in place from behind. 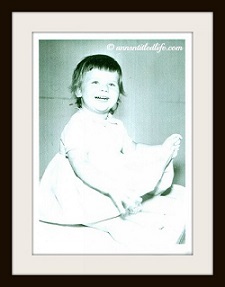 • This is what mine ended up looking like. Yours may be different depending on the whether you use store bought or homemade shamrocks, beard, and if you use a different hat or bow. 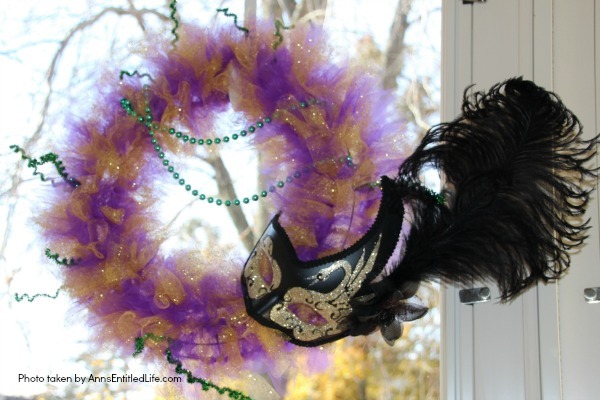 Follow the step by step instructions of this Glitter Mardi Gras Mask Wreath Tutorial to make this beautiful, sparkly, Mardi Gras Wreath. 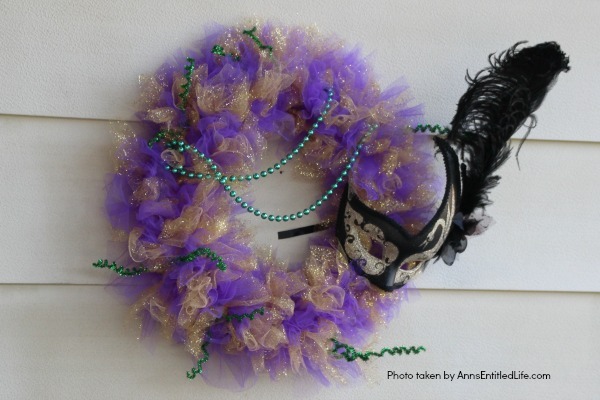 This highly customizable, simple to make, Glitter Mardi Gras Mask Wreath will look great on your front door, over your mantel, or on a wall. 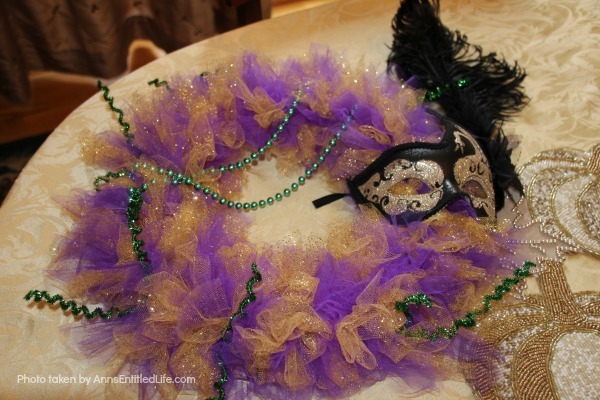 Truly unique Mardi Gras decor! That is the same wreath in the photo(s) above. I just placed it in different areas, some dark, some light, to show how the light and dark effects the look of the wreath. In person, it is simply stunning (truly). • Tulle is significantly more difficult to work with than a cotton material. 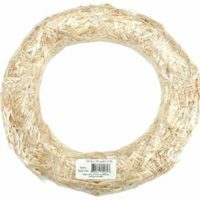 Keep that in mind when making this wreath. • You want your wreath nice and full. If you skimp, you cannot hide it. So, make sure your tulle is nice and full! • Sequin glitter tulle sheds. A lot. With that in mind, I strongly suggest you cover your work surface with a towel (or it will look like a glitter-bomb went off in your house). • We used pipe cleaners for some texture. You could substitute feathers! • If you want the same look we did, follow the color scheme used. If you want a different look, go for it! 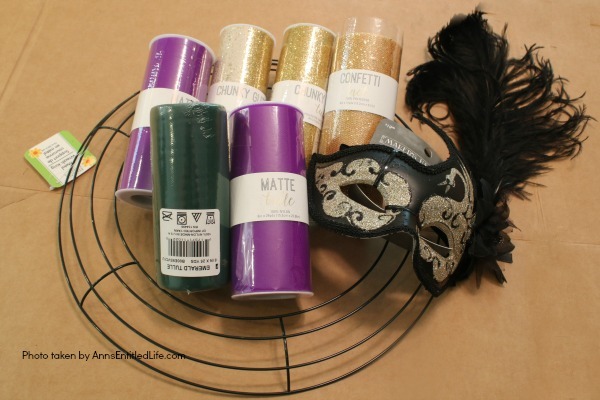 Your best bet is to start with your mask choice, and then match the colors to that (tulle rolls are easy to find). Just remember this is a sparkling tulle wreath, so make sure one of your tulle colors glitters with sequins. 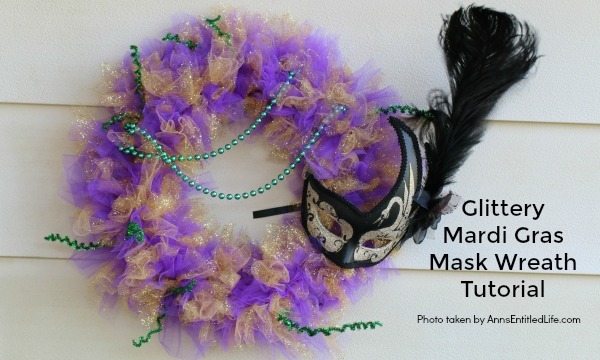 • There are several ways to do the tulle color grouping on this wreath – two alike knot colors, three alike knot colors, etc. and repeat. 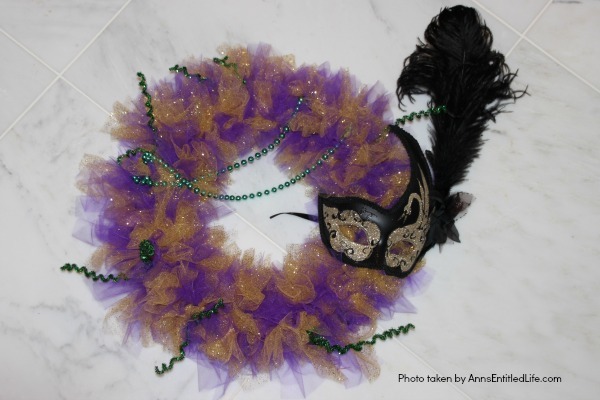 Ultimately, after playing around and experimenting, this wreath was created with alternating tulle knots meaning one gold, one purple, one gold, one purple (etc until finished). 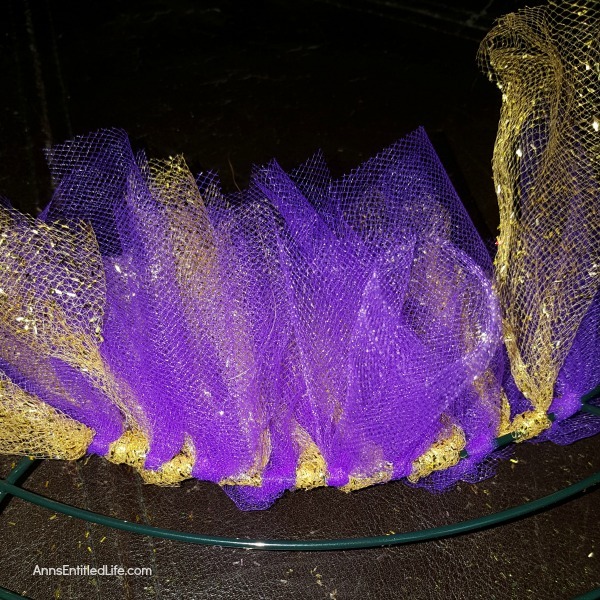 • Cut tulle into 5″ strips. You will get 180 strips per 25-yard roll. • Every other tie is a different color. You are alternating colors for this one. 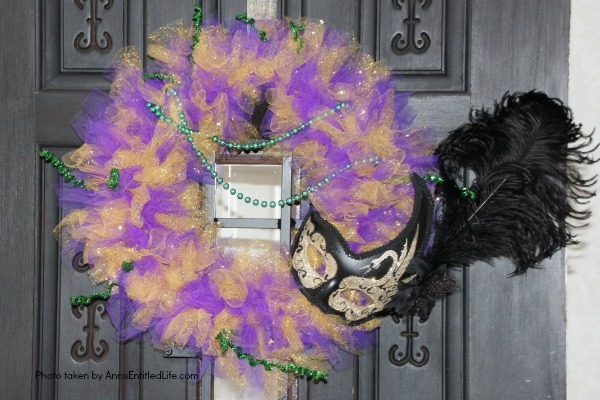 Leave the second outer row of the wreath frame empty for beads, pipe cleaners, and mask attachment. 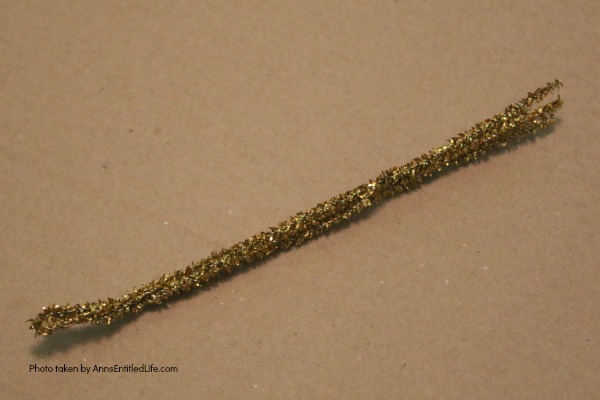 • Wrap your pipe cleaners around a chopstick or a pencil to form spirals. • Twist around the frame, and allow the curly ends to poke out through the tulle. • Clip the ends of the beads (where the necklace meets) using scissors (to form a long strand and not a necklace). You can twist the clipped ends around the frame allowing the beads to swag down a bit. They will secure like a twist-tie would. You can use a dab of hot glue to secure in place if you like. • Tie the mask to the frame. The mask should have ribbons on it making it simple to secure. You can dab with a bit of hot glue to hold in place.